This week’s guest post comes from Caroline Johnson, Founder of Line Writing Co. Being a business owner is tough. There are constant demands to not only complete what you have set out to do, but to stand out in a crowd. Sometimes it can seem like we’re stuck in a sea of people who do exactly what we do, right? There are often days where I look around at all the other writers who do what I do and those creeping thoughts of unpreparedness and doubt come into my mind. As someone who primarily writes for other people, I’ve learned a lot about what it takes to stand out. I’ve learned that we actually don’t always like ourselves as much as we should. This might not make sense yet, but let’s dig in a little deeper. Why do People Choose you for Their Business? In what I’m currently referring to as my “Marketing bible,” aka Get Clients Now by C.J. Hayden, this question was finally answered for me. The only way you’ll get people to do business with you is if they know you, like you, and trust you. The knowing part is easy, right? You stick your ad in a magazine, keep up a consistent presence on social media, and you become somewhat recognizable to your niche audience. But how do you go beyond that? How do you show people a side of you that’s not strictly business? I’ll give you a hint: transparency. What do you Mean Transparency? The type of transparency I’m talking about doesn’t mean bearing your soul for the world to see. It doesn’t mean diving into the nitty-gritty of the behind-the-scenes work you do and explaining the financial stresses of owning a business. 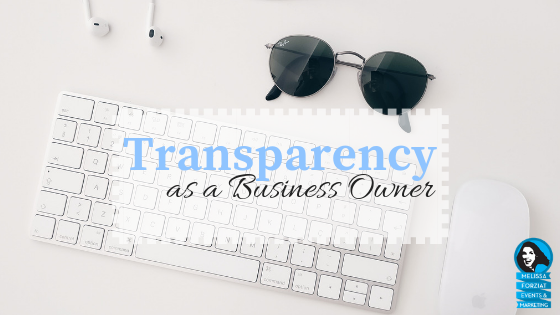 While those might be conversations to have with other entrepreneurs in a safe space, I’m talking about the transparency we need to show our clients. What I mean by transparency is showing potential and current clients just enough to make sure that they know and trust us. This is not only important when it comes to gaining their business, but it’s imperative in creating relationships that bring back recurring orders and conversations that help you come to the front of their mind next time someone needs a referral. One way to start with this process of moving towards transparency is by looking through your website. Look at the content that you’re putting out to your audience. Does your “about me/us” page share about YOU, or does it just share a list of accomplishments? Does your services page showcase the personality behind why you do what you do? One word I like to focus on is your “why.” Think about it…think back to why you started in the first place. Think back to why you still are here running your business. Why do you keep going? Now, try to put yourself in the shoes of a stranger. Can they get all of this information just by reading the information you’ve made public? It’s so imperative that we as business owners showcase who we are to clients to ensure that they feel like they’re getting a rare look into the “why” behind our business. THIS is the part that makes people like you. It makes people feel like, “Hey, I might know someone like this in real life.” It makes you relatable. It makes you likeable. So, why is this rare? Well, it’s certainly uncommon in the world of business. We’ve taken away the personality behind what we do. That personality becomes only apparent during face-to-face interactions, which, unfortunately, we just don’t have as often anymore. Getting people to trust you involves building your reputation. It involves being confident about who you are and what you’re able to do. This is another place where transparency comes into play. Accomplishment listings are great, yes, but they don’t give any insight to what you gained from those accomplishments. Putting a new spin on your abilities helps bring your personality back into play. It gives perspective clients a look into not only who you are and why they should like you, but also why they should trust you to complete a service for them. People are going to pay someone they believe in. Make them believe in you! Next, talk it out with someone else. Bringing in a content writer for an outside perspective gives you an entirely new, fresh set of eyes. If you’re not ready for someone else to write and share about you just yet, talk it over with a partner, a friend, or a colleague. What can they tell about you just by reading what you’re sharing? What about you is missing? Are there things that you should be sharing that you are not? This is possibly the most cliché sentiment there is, but it’s especially true in this scenario. Don’t try to be someone you’re not when it comes to your business. If you don’t feel capable of doing something, list the reasons why you are. Convince yourself of your own greatness, because, the thing is, nobody else is going to do it for you. Share your “why” and your motivations and your accomplishments. Give the world a sneak peek into what makes your business stand out amongst a crowd. Be your own biggest fan, share lessons you’ve learned, and use transparency as a tool to not only attract clients, but to keep them coming back for more. Caroline Johnson is the Founder of Line Writing Co. and provides content writing services to business owners around the world. After breaking free from the 9-5 lifestyle, she began her journey to crafting engaging and purposeful content that goes beyond just sharing information. 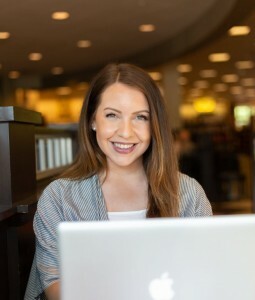 Utilizing the art of storytelling and always trying to dig a little deeper, Caroline’s goal is to make business owners recognize how capable and amazing they really are…they just sometimes need an outside perspective to see it! Caroline works from her home office accompanied by her forever-employee-of-the-month, her dog, Tucker. You can find her online or on Facebook.